Thomas Beatty et al have an interesting new paper on arXiv today, primarily about the transiting brown dwarf KELT-1b. They’ve used the Spitzer Space Telescope to record the infra-red light as it varies around the 1.3-day orbit. The x-axis is “colour”, the difference in flux between two infra-red passbands at 3.6 and 4.5 microns. The y-axis is brightness (in the 3.6 micron band). The underlying orange and red squares show where typical M-dwarf stars and L and T brown dwarfs fall on the plot. The solid-line “loops” are then the change in position of the atmospheres of KELT-1b and WASP-43b around their orbits. At some phases we see their “day” side, heated by the flux of their star, and at others we see their cooler “night” side. The blue line is the track where something would lie if there were no clouds in its atmosphere. The fact that KELT-1b’s loop doesn’t follow the blue track, but moves significantly right (to cooler colours) implies that the night side of the brown dwarf must be cloudy. The night side of WASP-43b, however, appears to be less cloudy, according to its track. The plot for WASP-19b shows a loop with a marked excursion to the right, suggesting a cloudy night side to the planet. For WASP-18b, however, the loop follows a trajectory nearer the blue “no cloud” track, suggesting a clearer atmosphere. This entry was posted in exoplanet atmospheres, Hot Jupiters, KELT planets, WASP planets and tagged KELT-1b, Spitzer Space Telescope, WASP-18b, WASP-19b, WASP-43b on August 30, 2018 by waspplanets. Star spots are cooler regions of a star’s surface, caused by magnetic activity, and emit less light. If a planet transits across a spot it blocks less light, and so we see a slight rise, a bump, in the transit profile. On the left (in blue) is a transit from a new paper by Espinoza et al, who have observed transits of WASP-19b with the Magellan telescope. A clear bump is seen, indicating that the planet passed over a cooler spot. On the right (in red), however, is another transit showing a clear dip compared to the expected transit lightcurve. This implies that during this transit the planet passed over a brighter region on the star. This is the first time such an event has been seen. The authors deduce that the bright spot must have a size of about a quarter of the stellar radius and must be 100 K hotter than the rest of the star. Such regions are not seen on our own Sun. The red data-points are from the Hubble Space Telescope, showing a spectral feature, but the new data by Espinoza et al (white points) are consistent with a flat spectrum within the limits of the data. This entry was posted in exoplanet atmospheres, WASP planets and tagged starspots, WASP-19b on July 30, 2018 by waspplanets. The European Southern Observatory have put out press release about observations of WASP-19b with the Very Large Telescope. A team led by ESO Fellow Elyar Sedaghati have found titanium oxide in the atmosphere of an exoplanet for the first time. ESO’s graphic (credit: ESO/M. Kornmesser) illustrates how observations during transit allow us to analyse an exoplanet’s atmosphere. The star light shines through the atmosphere, where light at particular wavelengths is absorbed by molecules, causing the light that we see to carry a distinctive signature of the atmosphere’s composition. 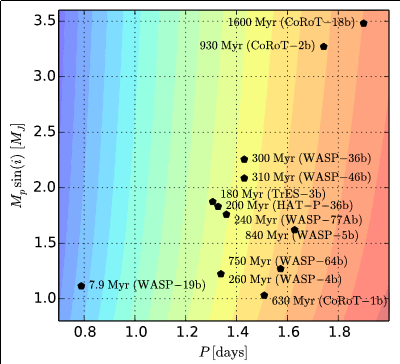 The team observed three different transits of WASP-19b, each in a different colour, to produce one of the best transmission spectra of an exoplanet so far. The titanium oxide (TiO) features are marked, along with those from water (H2O), sodium (Na) and scattering due to haze. This entry was posted in exoplanet atmospheres, Hot Jupiters, WASP planets and tagged titanium oxide, transmission spectroscopy, VLT, WASP-19b on September 15, 2017 by waspplanets. Congratulations to the HATSouth project for the discovery of HATS-18b, a hot Jupiter with the very short orbital period of only 0.84 days. The other known hot Jupiters with periods below 1 day are all WASP-South discoveries (WASP-19b at 0.79 d, WASP-43b at 0.81 d, WASP-103b at 0.93 d and WASP-18b at 0.94 d). Since such short-period systems are the easiest to find in transit surveys (owing to lots of transits!) they must be very rare, presumably because tidal forces are causing the orbits to decay, so that the planets spiral into their stars on relatively short timescales of tens of millions of years. The HATSouth team note that the rotational periods of the host stars of HATS-18b and WASP-19b are much shorter than expected given the ages of the stars, and suggest that the stars have been spun up by the same tidal interaction that caused the planet’s orbit to decay. By modelling the in-spiral process Penev et al arrive at constraints on the “quality factor” Q‘* of the star. This is a measure of how efficient the star is at dissipating the tidal energy resulting from the planet’s gravitational tug on the star, and this sets the timescale for the tidal decay. 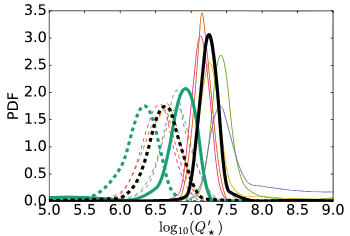 Penev et al argue that the log of Q‘* is between 6.5 and 7, one of the tightest constraints yet estimated. Estimates of the tidal quality factor, from modelling the HATS-18b and WASP-19b systems. The different models use different assumptions and are explained in the text. Figure by Penev et al. 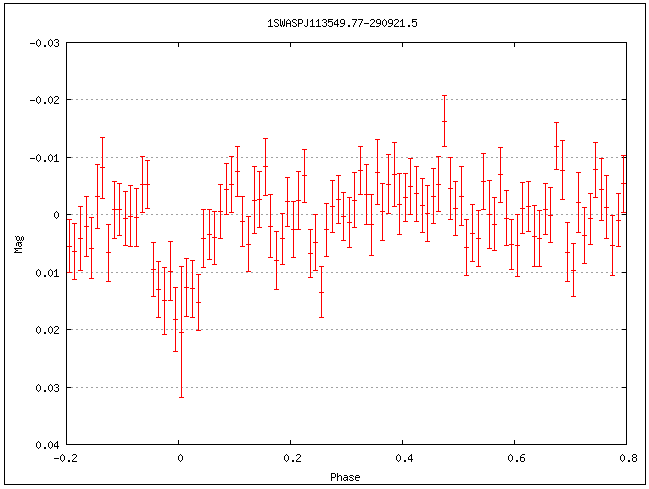 This is thus the faintest detection of a planet yet by WASP-South and so is reassuring about WASP data quality. This entry was posted in HATnet planets and tagged HATS-18b, HATSouth, tidal decay, WASP-19b on June 16, 2016 by waspplanets. Closely orbiting hot Jupiters raise a tidal bulge on their star, just as our Moon does on Earth. Since the planet is orbiting faster than the star rotates, the tidal bulge will tend to lag behind the planet and so its gravitational attraction will pull back on the planet. The orbit of the planet is thus expected to decay, with the planet gradually spiralling inwards to destruction. Calculating how long this will take is hard, and depends on the efficiency with which energy is dissipated in the tidal bulge of the star. This is summed up by a number called a quality factor, Q, which is, crudely, the number of orbital cycles required to dissipate energy. The higher this number the slower the decay of the planet’s orbit. 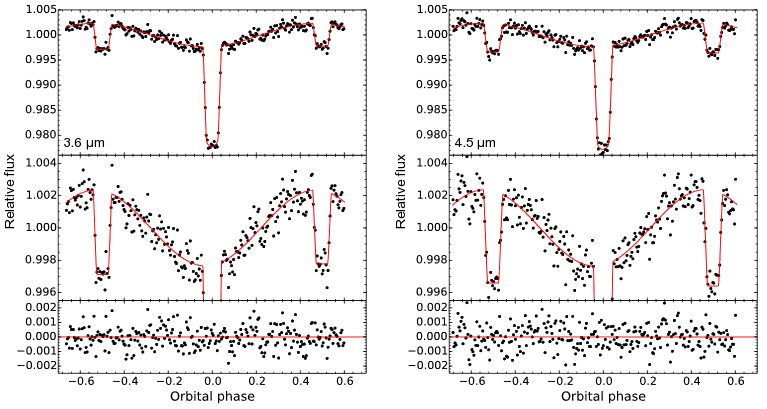 In a new paper, Reed Essick and Nevin Weinberg, of the Massachusetts Institute of Technology, present a detailed calculation of Q for hot Jupiters orbiting solar-like stars. They arrive at values for Q of 105 to 106, assuming a planet above half a Jupiter mass and an orbital period of less than 2 days. The figure shows the resulting infall timescales of all the hot Jupiters predicted to have remaining lifetimes of less than 1 Gyr. By far the smallest lifetime is that for WASP-19b, which is predicted to spiral into its star within 8 million years. This would mean that shifts in WASP-19b’s transit times would be readily detectable, with a shift accumulating to 1 minute in only 5 years. The calculations presented here are at odds with deductions that Q must be around 107, based on explaining the current distribution of hot-Jupiter periods (e.g. Penev & Sasselov 2011), which would give a much slower orbital decay. We can determine who is right by monitoring transits of WASP-19b and similar systems over the coming decade, and it will be interesting to discover who is right. This entry was posted in Hot Jupiters, WASP planets and tagged tidal decay, WASP-19b on January 5, 2016 by waspplanets. A team led by Ian Wong of Caltech have announced observations of the hot Jupiters WASP-19b and HAT-P-7b, looking at infra-red light using the Spitzer Space Telescope. By observing the planets around their entire orbit they detect the transit, caused by the planet passing in front of the host star, the secondary eclipse, when the planet passes behind the star, and the “phase curve” caused by the changing visibility of the heated face of the planet. The figure shows the infra-red light (“heat”) of the WASP-19 system in two pass bands (3.6 microns and 4.5 microns). The middle panels are expanded to show the phase curve, while the lowest panels show the residuals about a fitted model (the red line). By fitting all three features, the authors can constrain the temperatures of the “day time” heated face of the planet (which faces towards us near the secondary eclipse) and of the “night time” face of the planet (which faces us near transit). From there they can estimate the “recirculation”, how efficient the planet is at redistributing heat from the day-time face to the night-time face. Such short-period planets are phase-locked by tidal forces, and so always present the same face to the star. Thus redistribution of heat energy requires powerful winds circling the planet. An interesting plot by Wong et al shows the recirculation in different hot Jupiters against the albedo (the fraction of energy that is reflected). 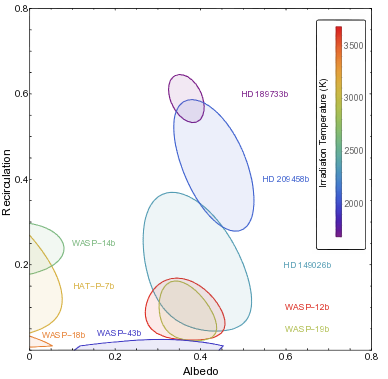 There appear to be two groups of hot Jupiters: ones with albedos near 0.4, such as WASP-19b, and ones with much lower albedos, such as WASP-14b and WASP-18b. So far there is no simple explanation for this difference. 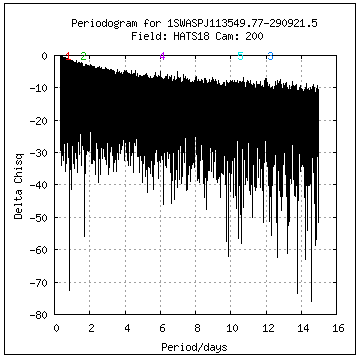 longer-period, less-irradiated hot Jupiters such as HD209458b and HD189733b are better at redistribution. This entry was posted in exoplanet atmospheres, Hot Jupiters, WASP planets and tagged phase curve, recirculation, Spitzer, WASP-19b on January 4, 2016 by waspplanets.